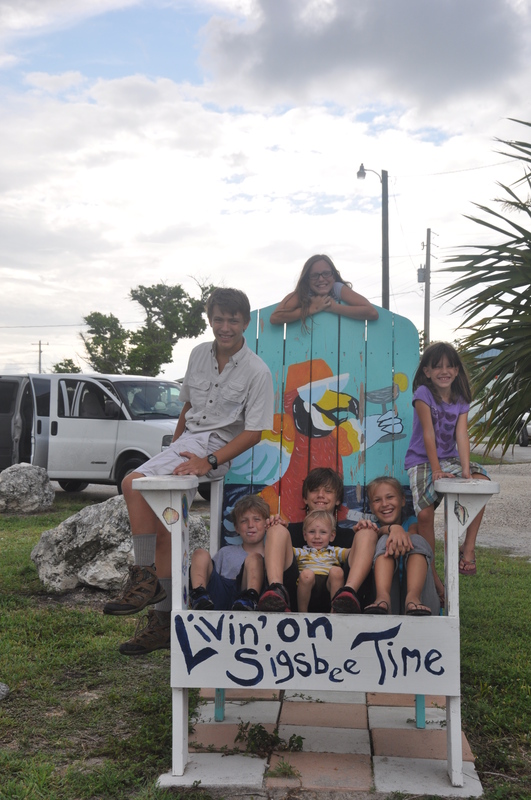 We got back last night from our 4 day/3 night trip to Key West. Three nights in a tent is a PR (personal record) for me, I’m sure. I like the **idea** of camping, but the reality is less appealing. Even Bill remarked that my fuse gets pretty short while camping, which is his polite way of saying that I have no fuse at all. As I told one of my daughters, while on this trip, “It’s all about being at peace with dirt. The amount of fun you have is directly related to how dirty you are willing to be.” I then looked at my husband and told him, with a forced smile, that I was doing a pretty good job of being at peace with the dirt. He just shook his head. It’s all relative. I did better than when we camped in Missouri in 2007. The first adventure in camping with 7 children is getting all that stuff in the van. Tents, sleeping pads, a cot for me, food, things for cooking food, clean clothes, towels, pillows, sunscreen, bug spray. On Friday night, as we packed most of the stuff, we quickly realized that some things just weren’t going to make the cut: beach toys, the bottled water, folding chairs. We have a platform that attaches to the hitch on the van which is large enough to hold our giant cooler and the smaller tents. We saved that part of the loading for Saturday morning. The next adventure is trying to get out the door in a timely fashion. I am a pro at this, so we left right on time at 9 am, which is an hour after I hoped to leave, and two hours after I planned to leave. I hate coming home to a dirty/untidy house, and even if I didn’t mind a sink of dirty dishes, getting 9 people up, dressed, fed and out the door quickly is a challenge. I don’t know how families with children at a physical school do it. The GPS told us it would take about 7 hours to make the journey. Naturally, pit stops added some time, as did traffic and what was, apparently, a lover’s spat on a single lane/no passing section of Route 1 in the Keys which stopped us dead for about 15 minutes. Yes, really, a couple who was too old for such shenanigans felt the whole world should come to a halt for them. We got to our campsite around 6 pm. The last 100 miles of the journey is on that Route 1: often single lane and where there are 2 lanes, it is usually through built up areas with lots of slow-moving traffic and stoplights. It makes for a tiring 3+ hours. Our tent city, the first night. Beautiful. I had planned for a gourmet meal of hotdogs that first night, and Billy was put in charge of charcoal tending while the rest of us set up tents and made camp. Since we were combining camping with sightseeing, I had planned cereal or boil-in-a-bag omelets for breakfast, restaurants for lunch, and dutch oven meals for dinner. Unfortunately, this campsite did not permit open fires. They provided grills, but dutch oven cooking is difficult on a grill (for future reference, I think using aluminum foil to build up a charcoal bed under the dutch oven would help). We made dessert that first night in the dutch oven (while we ate hot dogs), and it was tasty but undercooked. The second night, I used our propane grill to cook the meal. I had pre-cooked the food, so it really just needed to be heated up. Our third night, we were out doing things and just got some pizzas to go. We’ll have that meal tonight, heated on my stove top. If you are looking for a good camping cookbook, I highly recommend The Scout’s Outdoor Cookbook, which covers all meals, snacks, and desserts, and utilizes different cooking methods. Predictably, there was dirt, there were bugs, and it was hot and sticky. Also, predictably for this time of year in Florida, there were thunderstorms. As we pitched tents, Fritz looked over at the two other groups of tents and wondered about the tarps: extra thick plastic strapped on with bungee cords. The next day, Bill walked over and noticed the tent stakes that looked like railroad spikes. That first night, we learned why. Heavy duty tarps on our neighbors’ tents. But first, let me introduce the campground. 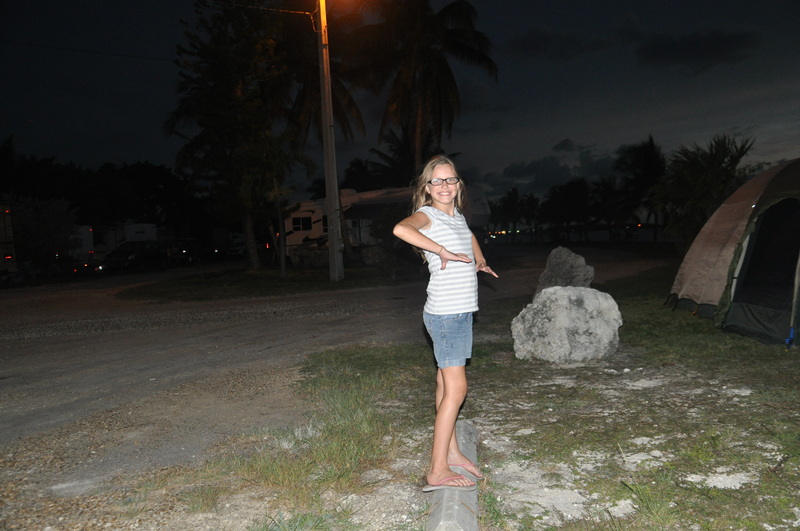 We stayed on a part of the Key West Naval Air Station called the NASKW Campground. You have to be military, DoD, some DoT, or some NATO to use the facility. 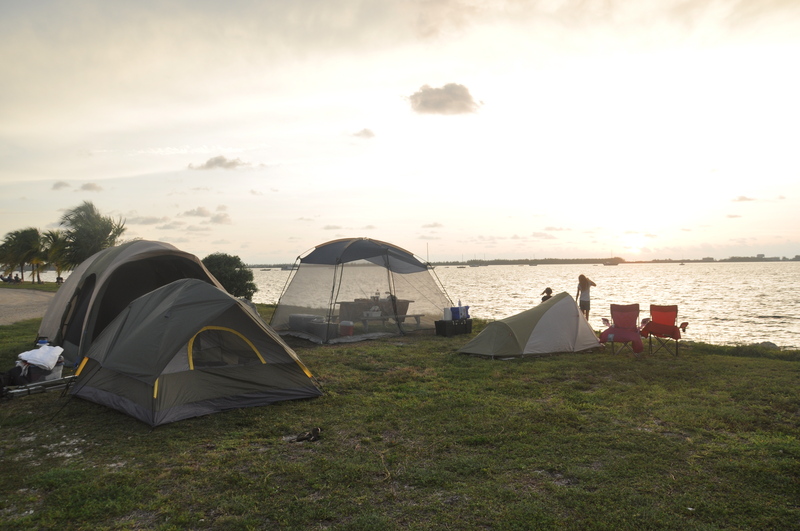 I do not think there are any other campgrounds on Key West, but there are plenty of campgrounds on the other islands. 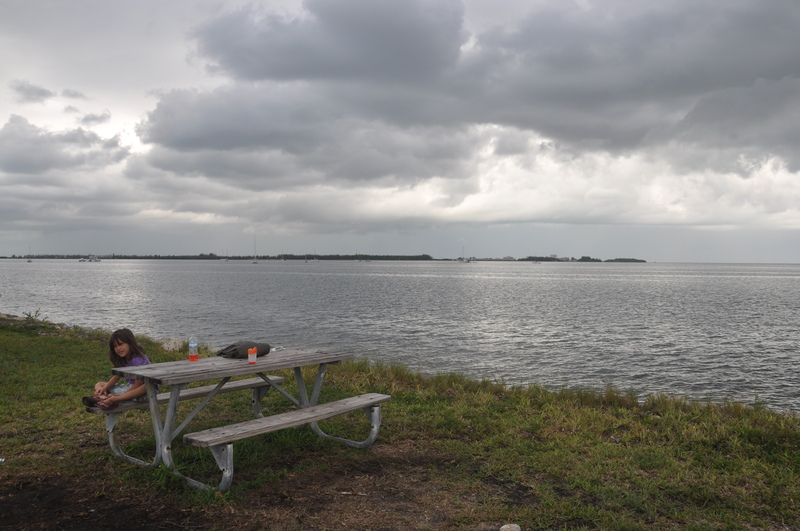 If you go tent camping in the Florida Keys during the rainy season (May – November), I highly suggest you read about my experiences. If you are military and want to go camping at the NASKW Campground, I recommend it. 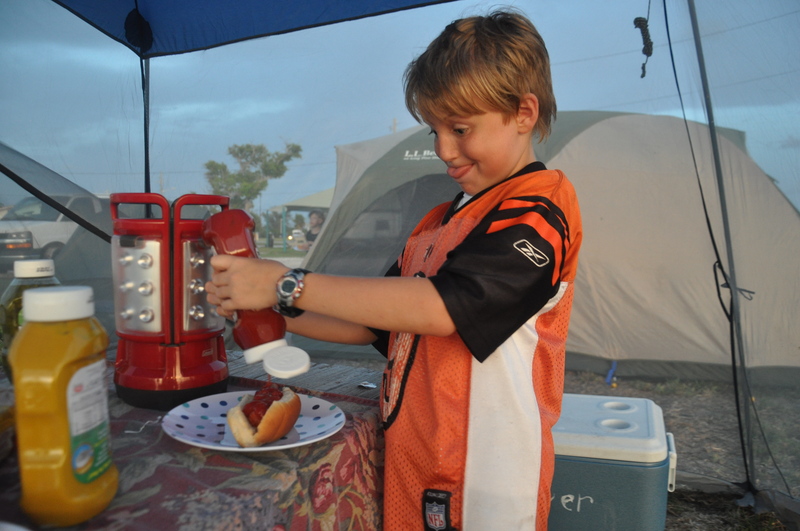 Most of the campers are in RVs, and most are retirees, and everybody was very friendly. There are a commissary and PX close by, but they are closed on Sundays and Mondays. Not too far off base are two Publix grocery stores, and the gas station right off base sells propane. There are two different camp sites, but we only saw the one where we camped. Our spot was close to the bath house which was tiled and had hot water – probably the nicest camp bathroom I’ve used. There was a laundry on the other side, and the first dryer was broken in the “on” position, which was most fortunate for us. All the tent camping sites where we were are on the water. 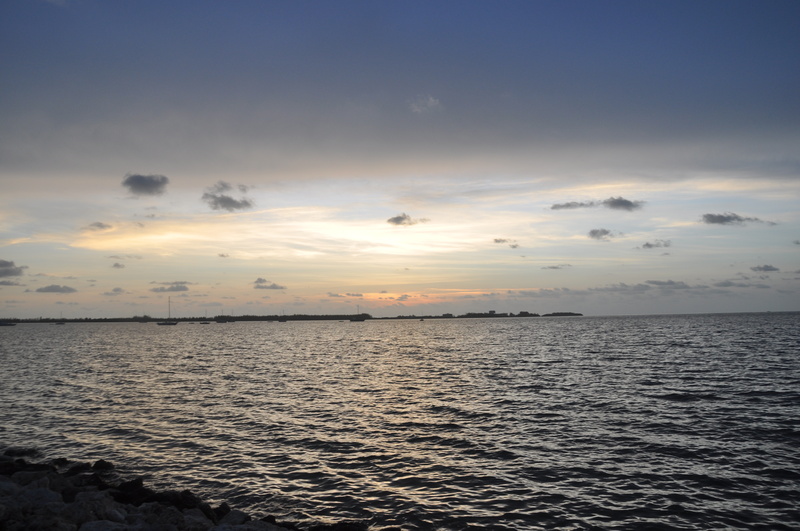 This side of the island faces the Gulf of Mexico, and the sun set on the horizon to our left. 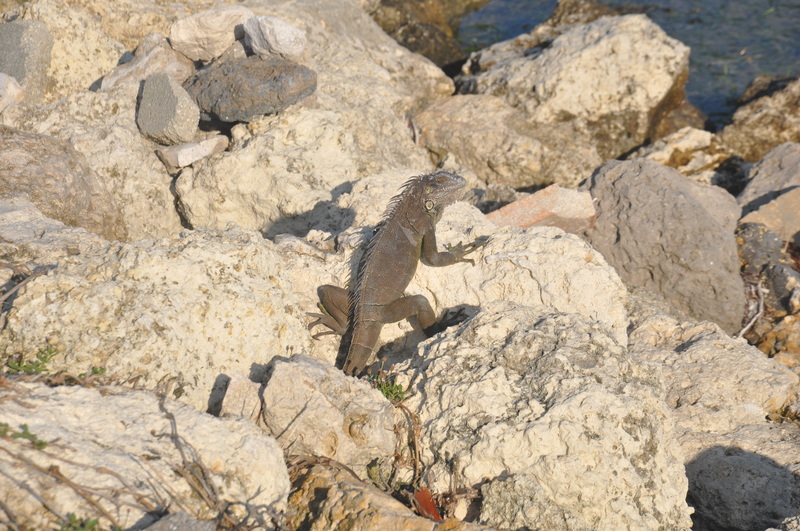 He lived in the rocks next to our campsite. This one lived a few campsites down. 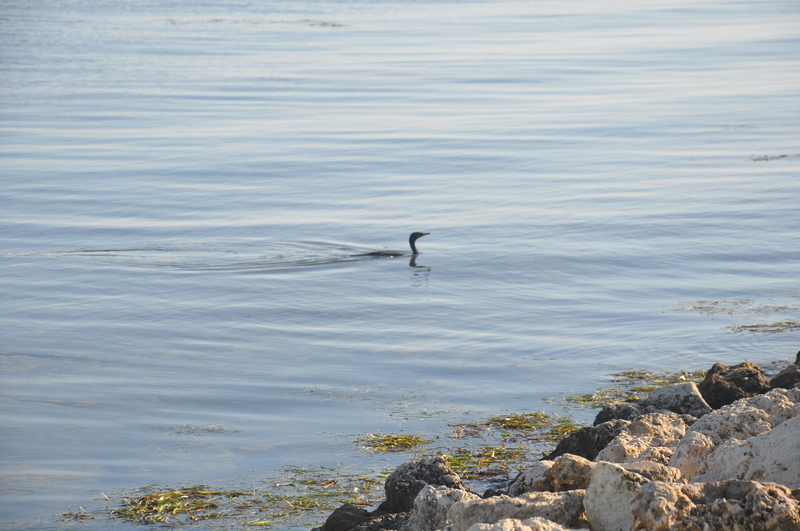 An anhinga. They swim underwater pretty fast. That first night we sat and watched a storm approach on the horizon to our right – the north. The wind started about 11 pm, and the first thing it did was take out our screened tent. Bill gathered it and threw it into the van. The next gust caught the vestibule of our big tent and pulled the stakes loose. Unfortunately, Bill had faced our tent almost exactly to the north. As the storm hit, the wind and rain went right through the opening and filled the whole thing like a sail. I held onto the interior opening while Bill stood in the rain and held the vestibule down. Once he pulled the rain fly down far enough, the wind went over the roof. He stood outside for about 30 minutes getting pelted by a cold, stinging rain while lightning flashed around him. Inside, Mary slept peacefully to the right of the doorway and George sat wide-eyed on the cot to the left. In between, the floor was wet. Our two other tents fared well with only minor leaking. From beginning to end, I think it was an hour for the storm to pass. We did manage to get some sleep, but we were damp. 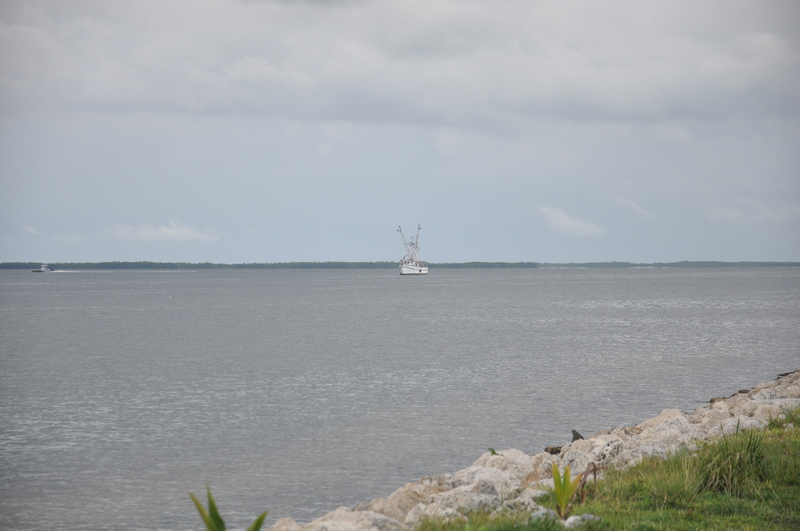 This shrimp boat stayed in the same spot the whole time we were there. The next day, Bill rotated the tent so that it faced west. It’s a good thing. Again that night we watched a storm approach from the north. Again, it hit about 11 pm. Again, the first thing that went went was the screened tent which we had already put on the ground weighted with one of the trunks of supplies. The wind pulled it right out from under the trunk. Bill had to wrestle it in the van as the wind tried to pull it from him. In the meantime, the big tent was under attack, and the wind had whipped the vestibule out of its stakes. I had put our mallet in the vestibule so we could find it easily, but the violence of the storm had thrown it under the tent and we did not find it until we packed up. I had grabbed hold of the tent and was struggling to keep it down. I even heard a snap and feared that a pole had broken. Bill, having gotten the screen into the van, assured me it was only bent a bit. Fritz came out of his tent to help. The wind was hitting the side of the tent this time, but this storm was much stronger. Bill held the front vestibule corner and Fritz manned the rear of the tent, both from the outside. I was in the interior supporting the corner by the vestibule. And then the rain hit. I had my back to the tent wall and could feel the pole bending around me. The tent and fly did not protect me from the sting of the drops and eventually did not protect me from the wetness of the rain either. I did not get as wet as my men, but half of me did get soaked. The storm was so loud that we had to shout to hear each other, even though we stood only a few feet away, and when the gusts came, we could not hear each other at all. A few minutes in, I started praying Hail Marys and realized that Fritz was, too. My 16 yo, when scared, prays Hail Marys out loud, over and over. After a few minutes of that, I switched to the Memorare and the Hail, Holy Queen, and then finally I started repeating “Mary, Star of the Sea, pray for us” in a fairly desperate manner. That morning, we had attended Mass at the Basilica of Saint Mary, Star of the Sea. We had prayed, as I’m sure they do every day, for protection from hurricanes. This was no hurricane, but it certainly was frightening. Deep in my heart, I couldn’t believe that God would bring us all the way down to Key West only to have us hurt or killed in a bad storm, and as I stood over Mary and George blissfully unaware of the violence going on around them, I took comfort in the idea that the Blessed Mother was also standing over us with her protective eyes. For 20 long minutes the rain and wind roared. Bill and Fritz continued to hold on for a few more minutes in case of gusts, but the worst had passed. The inside of the tent was dry. Katie had had to hold her two-man tent down while kicking her sleeping sister in an attempt to get some assistance. Billy and Peter had had to hold their tent poles up from the inside. I think Peter got a little wet. The next morning, one of the RV campers walked his dogs by us to see how we were just as he had checked on us the morning before. I told him I thought the storm was worse than the night before. He confirmed it and told me the wind was 40 knots (46 mph – gale force). Everybody who had been awake through that storm was slightly traumatized. Several kids suggested sleeping in the car Monday night or just packing it all up and going home. We stayed. Monday night, there was a thunderstorm off to the west, but the slightest of breezes came from the east pushing it away. It was a hot night without that wind, and we were anxiously restless because we know that a storm can come up suddenly. Bill said he woke several times every hour. I slept lightly until 3 am, when a stronger breeze was billowing the tent walls. I sat outside for several minutes watching the clouds, reassuring myself that the wind was still out of the east and that there was no immediate threat of a storm. We did have a thunderstorm later on Tuesday morning – around 7 am – from the east. There was lightening landing quite near to us, and one crack woke George. But the wind was tame and the rain was light. All smiles: just after my morning shower and getting ready to leave. We packed it all up and headed for home. Would I go camping again in Key West? Yes, but I’d prefer to try it during the dry season, and I’d prefer to get some heavy duty stakes and tarps. I also think I would just focus on sightseeing and forget all the food. I’d head to Publix or the commissary for pre-made meals (roasted chicken or deli sandwiches) and just be happy I wasn’t spending hundreds of dollars on hotel rooms. For a pure camping experience without the sightseeing, there are other places which would probably be more fun, less congested, and free from violent thunderstorms. I’ll do another post about the sightseeing portion of our trip. A lovely view to sit and watch. Well, there’s no denying it was quite an adventure! At one of our camping trips a few years back it rained so bad our tent flooded. We ended up sleeping in our van! 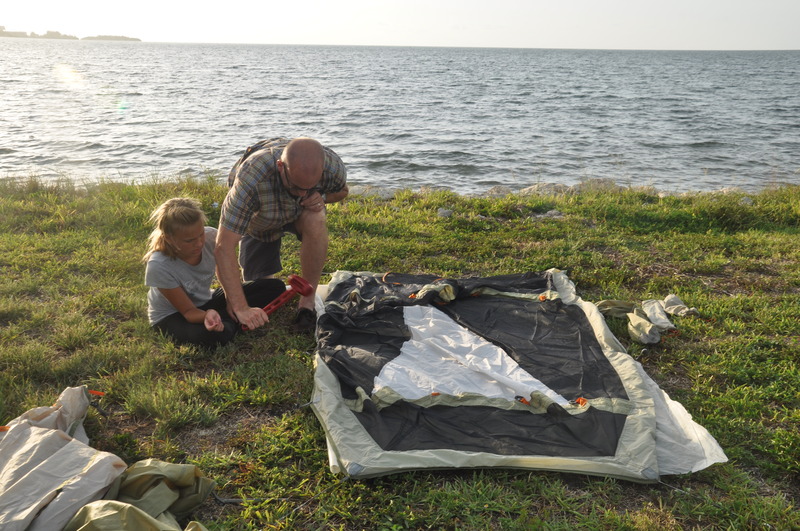 We learned about tarps for tents the hard way also – but a number of years back. We had our tent flood – and the toddler bed AND the pack n play. No fun. We have a large one, and some tarp poles from REI – it covers both our tents and Jim basically makes a lean-to over top with the poles. It works really well – we camp every year in NC with some families from church and last year we had a torrential rain storm for about 3 hours – we were the only completely dry tent! I was also laughing about packing the van – a couple of years ago we decided to rent a small U-Haul trailer (our annual camping trip is 5 days in the mountains, in the middle of nowhere). It’s amazing the difference – we do it every year now! No more shoving everything in around the kids. yes, I did mention getting a trailer. renting one would be better than buying one. We rent a 5 x 8 from Uhaul. $18.95 a day worth EVERY penny. I HAVE LIVED IN FLA for 40+ years. We went camping on Anclote Key/Island in 1977 Memorial Day. You can only get there by boat. When we as a couple were there in 09, we went to Ft. Jefferson on te Dry Tortugas National Park. It costs $150 a person to get there. It was a day splurge and a bucket list item. You can camp primitive there, but there are rats and we chose not to do so. The no seeums are very bad on most beaches. Better to check in with a AAA card at the local Wyndam hotel. Priceline is the best way to go. Don’t camp in the summer == that’s Florida 101. 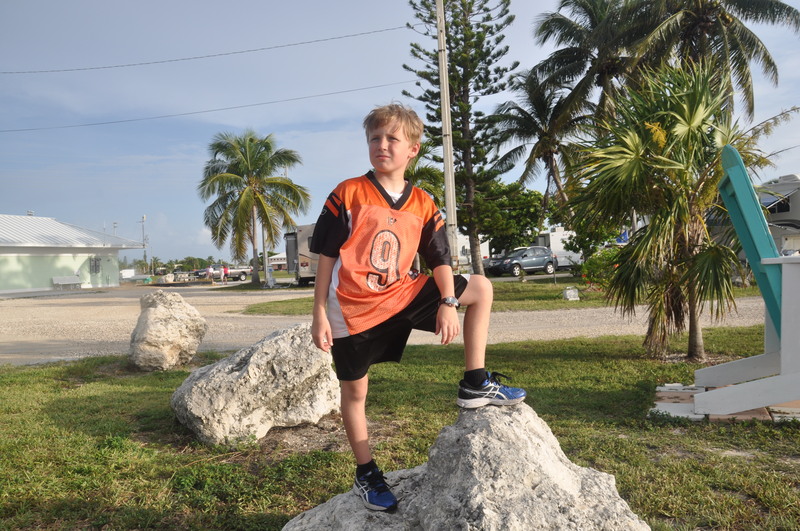 Did your kids get eaten alive on the beach? We could have told you that is how it is. Also Ft Myers beach is cheaper and more fun. They have a sunset celebration at night — every night at 7 ish. Kids get to see clowns and shows. Best to try that. 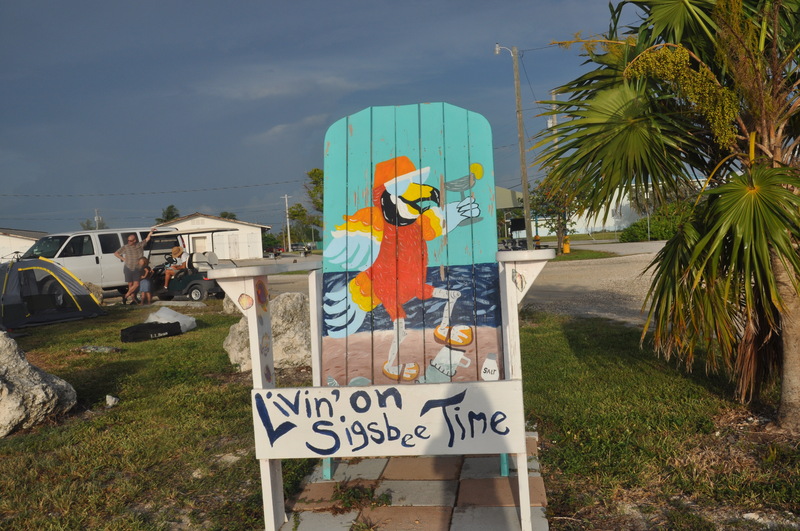 OH Bahia Honda state park has sleep 6 cabins for about $125 a night now. Woulda coulda told you about that too. They sleep more and is AC’d. That’s what we do. I COULDA WOULDA TOLD THIS FAMILY NOT NOT NOT TO CAMP IN 90 DEGREE SUMMER HEAT. But noooo, I doubt if they would have listened. Unbelievable! Here’s what I posted. Don’t know if she’ll post it but here’s what I posted. I HAVE LIVED IN FLA for 40+ years. We went camping on Anclote Key/Island in 1977 Memorial Day. You can only get there by boat. When we as a couple were there in 09, we went to Ft. Jefferson on te Dry Tortugas National Park. It costs $150 a person to get there. It was a day splurge and a bucket list item. You can camp primitive there, but there are rats and we chose not to do so. The no seeums are very bad on most beaches. Better to check in with a AAA card at the local Wyndam hotel. Priceline is the best way to go. Don’t camp in the summer == that’s Florida 101. Did your kids get eaten alive on the beach? We could have told you that is how it is. Also Ft Myers beach is cheaper and more fun. They have a sunset celebration at night — every night at 7 ish. Kids get to see clowns and shows. Best to try that. 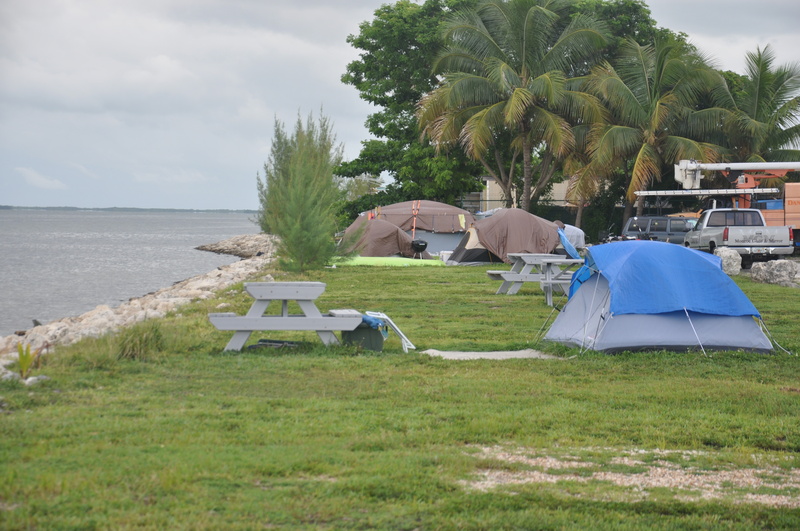 OH Bahia Honda state park has sleep 6 cabins for about $125 a night now. Woulda coulda told you about that too. They sleep more and is AC’d. Thanks, Jeanne. My boys go camping with Scouts every month except summer months, so we know camping in July isn’t ideal. But my husband’s job doesn’t give him many opportunities to take off, in fact, we had to cut this trip short so he could go back to work early. We knew what we were getting into. And we camped because our family is bigger than a sleeps 6 cabin…most hotel rooms are over $100 a night and we need 2 and we were there for 3 nights. 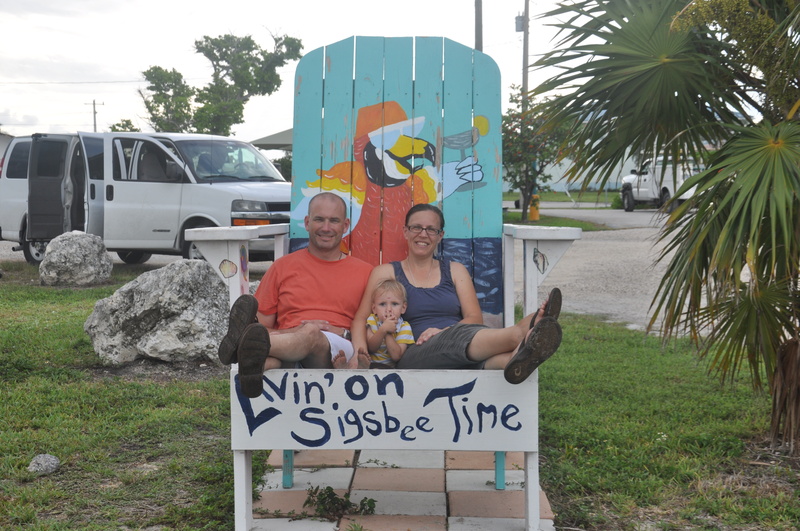 We splurged the week before and spent 2 nights in a hotel on Sanibel Island, close to Fort Myers. Very lovely, but the no-see-ums were pretty bad. I think we’re still scratching! I think Bahia Honda would be great for a camping trip if we ever get to go down there again, but we wanted to see Key West, so this wasn’t really a “camping to camp” vacation. 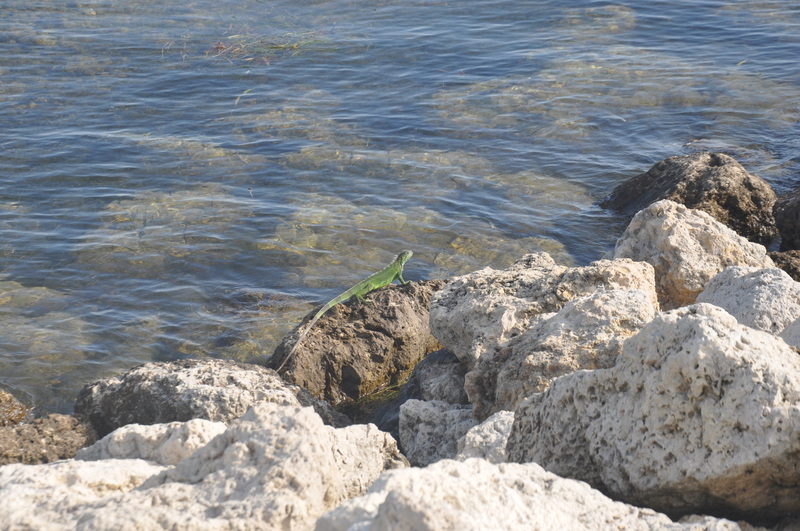 And I did see the boats to the Dry Tortugas, and have definitely added it to my bucket list – no kids on that one. We are only down in FL for another year, maximum, and I don’t know how many more trips we’ll be able to take other than local ones. It’s just the nature of our lives right now with this particular job. Certainly camping in the winter months is more pleasant, as my boys can attest, but we take what we get! Okay, I have lived here 40 years here Honda has cabins for cheaper than you would get a hotel room in Sanibel. Fort Myers is 60 back tonight. You need to use your common sense and I would make the reservation to come out to the lake I make the reservations for you next time girl you know should know better. While I’m out getting water from Home Depot and getting into the swing of homeownership, love to tell you that I was involved in the 70s and 60s but I’ll just pass on that. Take second-best okay, got plenty of places to do it. Try the springs next time. No seums are not as bad. Oh I will add one other thing before I going to Home Depot ha ha that’s just be friends because you live here or have lived here or whatever you move and just cancel commonsense check out Fort Myers Beach our specials okay if you stay there the sun sets celebration is like better than Mallory Square.